Icelandic Professor Emeritus and octogenarian Erlendur Haraldsson (1931) has built a name for himself chiefly as a result of his psychological research into paranormal and psychokinetic phenomena, mediumship, death, the possibility of an afterlife and reincarnation. He became widely known as one of very few scientists who investigated the ‘man of miracles’, Indian guru Sathya Sai Baba, over a prolonged period of time. 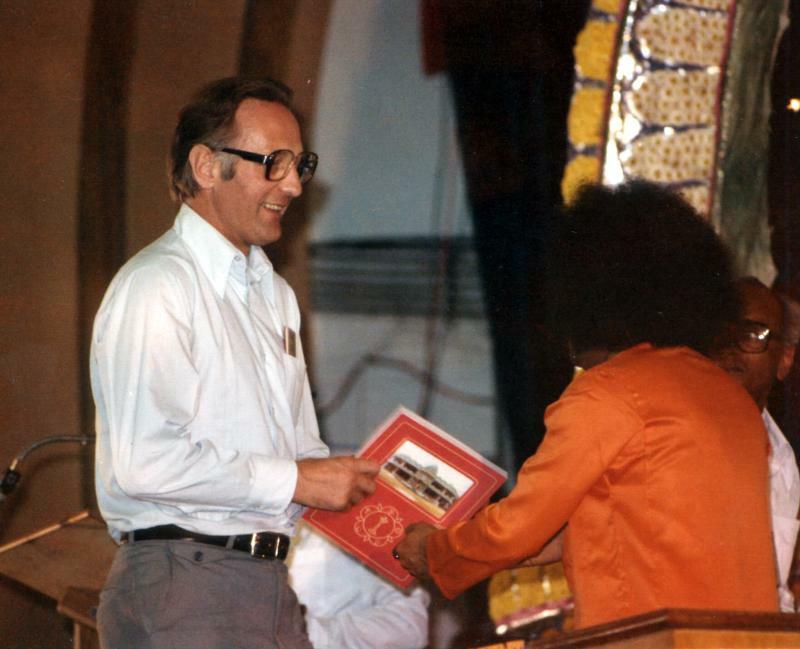 Haraldsson visited Sai Baba in India mainly in the seventies and eighties of the twentieth century and had numerous interviews and occasions to see him at work. Although Haraldsson and his fellow researcher Dr. Carlis Osis were denied any occasion to perform controlled experiments, their published account¹, perhaps willy-nilly, was seen by many to endorse Sai Baba’s claim of genuine materialization and bilocation, among other abilities. Absence of detectable fraud and arguments of plausibility led Haraldsson to a circumspect conclusion that Sathya Sai Baba might be ‘the real deal’. This was no sudden conversion-type turn of events. Every previous peer-reviewed paper by Haraldsson concerning Sai Baba, dating back as far as 1975 (‘Nothing up his sleeves’²), at least hinted in the same direction. Remarkably so for a psychic researcher who on every occasion emphasized the necessity of a neutral stance, in 1980 Haraldsson lauded Sai Baba in a commemorative book called ‘Golden Age’³, published by Sai Baba’s very own Trust to herald the dawn of a new era. Haraldsson called him a remarkable man on that occasion, a saint ‘true to his nation’. The first publication (England) was quickly followed by an American edition (different title), a German one and, over time, translations in 10 or more languages. It was generally received as a well-rounded depiction of an enigmatic man, who seemingly could materialize and dematerialize objects at will. In 1997 an English re-issue was published, with minor changes to the original. Further editions followed, 17 in total, with differing covers and differing subtitles, up til 2006, without substantial change to the original, although by 2006 nearly twenty years had passed since its first release, and Sathya Sai Baba had in the mean time become the focal point of growing controversy, due to the emergence of serious allegations of wrongdoing, allegations that had been made earlier, by the way, but became more widespread and of far wider scope. After years of silence on the issue of Sathya Sai Baba, claiming not to have anything new to say on the matter save a short article on a video clip which seemed to show Sai Baba fraudulently materializing a large necklace⁴, professor Haraldsson now returns to this subject with the publication of an update and rewrite of his erstwhile study¹. The title has changed little (though the subtitle is something of a foregone conclusion). It is called Modern Miracles: The Story of Sathya Sai Baba: A Modern Day Prophet. The book appeared a couple of weeks ago, both in print (412 pages) and as a Kindle e-book. As to its content, Haraldsson reshuffled some of his earlier material and added a sizeable number of chapters to fill in the near thirty-year gap. He also visited Puttaparthi in February of this year, together with Dr. Houtkooper, and talked to some close first-hand observers of the late guru on that occasion. On reading this new material, it also becomes apparent that Haraldsson kept on visiting Satyha Sai Baba at more or less regular intervals after the eighties. Of special interest at this moment in time is the section in which Haraldsson addresses the many allegations against Satyha Sai Baba that sprang up especially since 1999, when first reports of fraud, sexual misconduct and misappropriation of funds reached the news and appeared on the internet. They in turn led to a massive decline in devotees, especially those from the West. Chapter 32 (p. 321 onwards) deals with this issue, and that of Western critics, in quite unequivocal terms. Right off the bat Haraldsson disqualifies every scholarly entry on the internet because they are (by definition?) 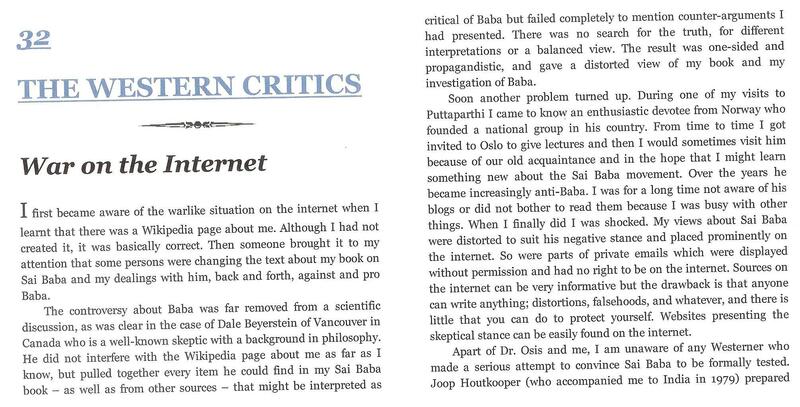 not peer-reviewed, then curtly dismisses professor Beyerstein’s objections and after that goes on to openly discredit ‘an enthusiastic devotee from Norway‘, who over the years became increasingly anti-Baba. Haraldsson goes on to say that sources on the internet can be very informative but with the definite drawback that anyone can write anything, and you can do little to protect yourself. The same holds true of Haraldsson’s assertion in this book, which is not peer-reviewed either, one might counterargue. Given the scarcity of his references as to this ‘war on the internet’ (only one particular webpage of Brian Steel is mentioned, between brackets), Haraldsson’s source material on which he bases his judgment here remains altogether vague. This leaves open the possibility that some of the very websites Haraldsson dismisses as anti-Baba were in fact copiously used by him to gather necessary background information and detailed accounts. If so, it is my view that he did it without proper reference to their sources and/or authors. Simply stating, as Haraldsson does here, that Websites presenting the skeptical stance can be easily found on the internet is not up to par. Moreover, such a general statement helps create the perhaps faulty impression that Haraldsson has studied many if not all of them extensively. The very fact of having been a devotee at some time during one’s life seems alien to Haraldsson and is apparently enough to discredit one’s judgment and opinions for ever, no matter how well they are underpinned. Once a fool, forever a fool, seems to be his credo. How can any sane westerner believe such tall claims as omniscience or omnipresence, is Haraldsson’s rebuke. Ipso facto, if you are so gullible to have believed this in the first place, you must be disappointed or disgruntled ever after, and by necessity remain clouded and lopsided in your current views. Haraldsson then briefly addresses the issue of Sai Baba’s alleged homosexual behavior. No indeed! If these were the things that made a man outstanding, Sai Baba’s fairytale claims and predictions of grandeur and his sexual ‘behavior’, it would be grave to the extreme. But to Haraldsson the whole matter of child molestation seems to be a mere squabble, as are all other moral compunctions any ethically attuned person would have with the character of Sathya Sai Baba. Haraldsson shows his true colours here, as far as I am concerned: cold, morally aloof, seemingly neutral and balanced but more likely narrowly pursuing a quite rigorous, self-serving academic agenda of promoting his own name and career, which meant keeping silent on certain matters when the master was still alive and secretly being quite enamored and taken in by the massive charm that the late guru of gurus was capable of. Haraldsson concludes this part of the chapter by listing three qualities that made Sathya Sai Baba outstanding in Haraldsson’s view, a modern day prophet no less, namely: his charisma, his ability over seven decades of performing miracles and thirdly, his ‘immense welfare and service activities‘. Without going into further detail, this chapter to me represents the gist of Haraldsson’s verdict concerning Sai Baba and his critics. Sai Baba was a great man, his critics are mainly ex-devotees, which skews them in their scope and perspective. The whole exercise of this ‘new’, so-called unique and painstaking examination of the phenomenon Sathya Sai Baba is to me more lopsided and hagiographic than Haraldsson’s previous stance, which, though aloof and one-sided, could be attributed to a lack of information. Haraldsson knows more than he lets on by now but this does not refrain him one bit from praising the late guru and discrediting fellow scientists, who scrupulously and meticulously tried to expose serious wrongs in the man and his movement. This is a preliminary comment I received today (9-11-2013) from fellow academic Brian Steel from Australia (see quote 2, where he is mentioned briefly). Steel is one of the most prolific and methodical researchers of Sathya Sai Baba over the last 15 odd years, see here: An Annotated Bibliography for Research on Sathya Sai Baba in Three Parts. Fascinating, Chris, but also a cause for alarm. I reserve full judgement till I can read the new edition myself. Haraldsson appears determined to preserve and promote his outdated and flawed judgements on SSB for posterity and to steadfastly deny any documentary evidence to the contrary. More later. 1. Erlendur Haraldsson (1987). “Miracles are my visiting cards”. 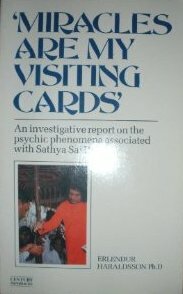 An investigative report on psychic phenomena associated with Sri Sathya Sai Baba. London: Century-Hutchinson, 300 pp. 2. Erlendur Haraldsson and Karlis Osis (1975). Nothing up his sleeves – the materializations of Sri Sathya Sai Baba. Theta, 3-5. 3. Erlendur Haraldsson (1980). True to his nation. In “Golden Age”, Sri Sathya Sai Books and Publications, Prasanthi Nilayam, Andhra Pradesh, 255-256.